My six year-old son, Braxton has always been a big fan of Pocoyo. 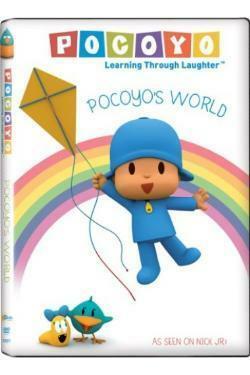 We were excited to get the opportunity to review the new Pocoyo’s World DVD. Pocoyo is a curious toddler who’s full of laughter and fun…and a touch of good natured mischief! The Narrator greets little Pocoyo every day and gently suggests an answer to anything that puzzles him. Pocoyo teaches preschoolers important life lessons, such as learning to share and take turns, in a world full of simple shapes, bright colors and cheerful music. Join in on the fun in Pocoyo's World! You'll laugh right along with Pocoyo and his friends on these twelve fun-filled adventures! Whether it's planting a seed, embarking on a camping trip or making friends with a little cloud, every day is an adventure in Pocoyo's World! Our Experience: Although Pocoyo is more aimed toward preschoolers, Braxton still loves watching it. I think it is because of the narrators gentle voice and Pocoyo's silly and entertaining antics that Braxton can relate to. I even found myself watching it right along with Braxton, and I think it is a really cute show. I love it!